Hidden until a specific action occurs on your opponent's turn. A shaman with mage and paladin Secrets. A Secret is a spell card that is cast normally but has a delayed, hidden effect, which only takes place when a specific event occurs. When a Secret is played, a Secret icon appears on the caster's portrait, but the name and details of the Secret are not revealed to the opponent until the card is activated by its hidden condition. Secrets can only be activated on the opponent's turn, preventing the player from triggering them themselves. There is however one exception - Competitive Spirit, which activates at the start of the player's turn. Secret is also the name of the ability all Secret cards have. Originally, secret cards were limited to mages, paladins, and hunters. In the Kobolds and Catacombs expansion, rogues became the fourth secret class. Secrets triggered by a minion being played will take place after any Battlecry. For example, Mirror Entity will copy a Twilight Drake after its additional Health has been applied. All Secrets available to a class have the same mana cost. This prevents opponents from guessing the Secret based upon its cost, which is the only information revealed when a player plays a Secret from their own class. Each class' Secrets are a different colour: pink for mages, yellow for paladins, green for hunters. If a player plays a secret belonging to another class, it will retain its original class colour. Secrets created by Lorewalker Cho are revealed publicly when played, and can be revealed after play by hovering over the Secret icon. In some cases a Secret's triggering event may occur, but the Secret's effect cannot activate. 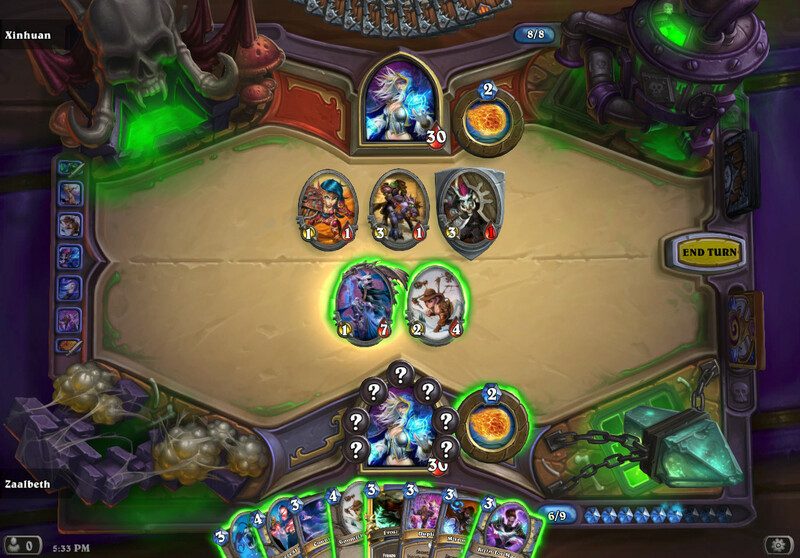 This can happen with Mirror Entity and Noble Sacrifice if there is no room remaining on the hero's board, with Avenge if there are no friendly minions left on the board, and with multiple Secrets when a Secret's specific target is removed by another effect, such as a previous Secret (see below). In such cases, the Secret will simply remain in place without taking effect, revealing itself, or giving any indication that its trigger condition was met. The limited choice of Secrets available to each class allows experienced players to logically determine the identity of unrevealed Secrets. Since each Secret has a specific trigger, players can intentionally test the Secret to attempt to determine its effect, attempt to draw the Secret out with weak cards and actions, or simply hedge their bets in order to minimise its negative consequences. For example, a player facing a mage with a single active Secret may choose to summon a weaker minion before summoning a stronger one, in case their opponent has Mirror Entity, and then attack with the weaker minion first, in case that Secret is a Vaporize. While they have special trigger conditions, Secrets are spells, and will activate all spell-related effects. Likewise, Secrets that deal damage can be improved by Spell Damage. When Secrets and triggered effects are activated from the same trigger, the effects will activate in the order in which they were played. Quest cards are like Secrets in that they take up a Secret slot, but they cannot be affected by Secret-interacting cards like Eater of Secrets, Kezan Mystic, or Flare. If a hero is destroyed by the activation of an enemy Secret, the game will end there, without allowing any triggering actions to complete. Example: Both players are at 2 Health. One player sends a Stormwind Knight to attack the enemy hero, thus activating the opponent's Explosive Trap. The Trap deals 2 damage to the first player, defeating them. The game then ends with the Stormwind Knight frozen mid-attack, with the second player still at 2 Health, resulting in a win for the second player. On the other hand, Secrets always resolve before the game can end, allowing Secrets such as Eye for an Eye to result in a draw, with both heroes destroyed as a result of the same action. For further details, see Advanced rulebook#Secrets. Players cannot have more than one copy of the same Secret active at any one time. 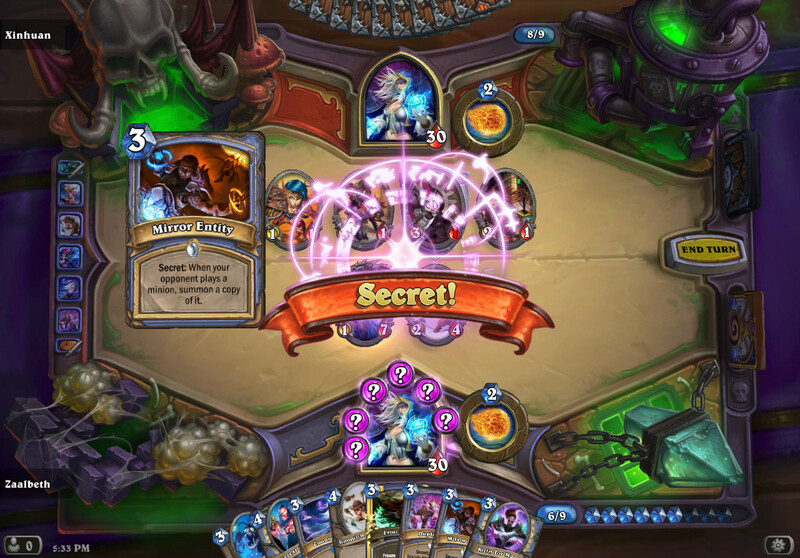 Players are unable to play Secret cards which match one of their active Secrets. When played directly from the hand, players can have up to 5 different Secrets active at a time. Once this limit is reached, the player will be unable to play further Secret cards. Kezan Mystic also does not allow the player to exceed 5 Secrets. Mysterious Challenger will not play more than 5 Secrets from your deck. As of January 2015, a bug allows Mad Scientist to place additional different Secrets into play through its Deathrattle, even if this causes the number of Secrets to exceed 5. Secrets beyond the 5 limit will activate and take effect normally, and in the correct order. Multiple Secrets can trigger from a single event, for example a minion attacking the hero will activate all Explosive Trap, Misdirection and Freezing Trap secrets active on that hero at the time. Secret: When one of your minions is attacked, summon a copy of it. Sometimes you get punched so hard they see double. Secret: When your turn starts, give your minions +1/+1. Competition can be an inspiration to improve oneself. Or kill all the competitors. The following cards have specific synergy with Secrets, such as providing additional effects when Secrets are cast, or destroying Secrets already in play. For cards which have synergy with spells in general, but not specifically with Secrets, see Spell-related. Battlecry: If you control a Secret, gain +1/+1. She's watching. Always watching. Secrets likely evolved from the cancelled "Combat Tricks" feature, removed early in the game's development. Similar to Secrets, these allowed players with active Combat Tricks who attacked their opponent to play a card on their opponent's turn, disrupting their play. Ultimately it was found that removing Combat Tricks actually made the game more fun, as well as further improving its speed. It seems the idea was not wholly abandoned though, since Secrets appear to represent a weaker form of the same mechanic. Rogues originally had Secrets, but this was moved to Paladins during the game's alpha. The designers were struggling to give the Paladins a class identity while Rogues already had "a ton a sneaky things" with Backstab, Stealth and Combo effects. The change served to refocus each class' strategic focus, helping to give Paladins "something that was their own thing" and giving Rogues a clearer picture of what the class wanted to do. Over 3 years later, Secrets were re-introduced to Rogues in the Kobolds and Catacombs expansion. According to Game Designer Peter Whalen, the developers wanted to capture the fantasy of each specific class in the expansion, with Secrets making a lot of thematical sense for the "sneaky and tricky" Rogues, and "now lots of classes have different stuff going on", allowing for the re-introduction of Rogue Secrets. The apparent original line-up of Rogues, Hunters and Mages may reflect a connection between Secrets and the Stealth/Camouflage/Invisibility mechanics in World of Warcraft, with these the only classes (except Druids in cat form) capable of employing such mechanics to ambush their opponents, similar to the function of Secrets in Hearthstone. In this respect Secrets are more similar to World of Warcraft Stealth than the Hearthstone Stealth ability itself, allowing the player to genuinely surprise the opponent. With Patch 1.0.0.4944, secrets were made to only be triggered on the opponent's turn. Prior to this, players could intentionally trigger their own secrets, allowing them to make use of them as additional spell effects, rather than counter-abilities. While most secrets were unaffected, some interesting play options were intentionally removed by this change. The developers stated that the ability to trigger your own secrets was preventing them from creating new and powerful secrets, due to being easily triggered by the controlling player prior to this change. While removing certain strategic possibilities, this change was therefore intended to allow for the creation of a diverse range of new secrets. The subsequently announced Curse of Naxxramas mage secret Duplicate was confirmed as an example of a card that the earlier design would have prevented from being implemented. Patch 3.0.0.9786 (2015-08-18): Competitive Spirit is added, the first Secret to specifically break the rule that Secrets can only activate on the opponent's turn. Patch 1.0.0.4944 (2014-03-11): Secrets can now only activate on your opponent’s turn. ↑ wowhobbs (2017-04-12). 🍀🎲 Secret Cho & Galvadon ~ Journey to Un'Goro ~ Hearthstone Heroes of Warcraft at 2:34. ↑ Observed by User:Taohinton, 2014-12-25. Attacking with Stormwind Knight into Explosive Trap, player at 2 Health, opponent at 24 Health. ↑ Screenshot - Deck contained 8 different Secrets when Mysterious Challenger was played. ↑ Ben Brode on Twitter. (2015-02-01). ↑ Gahz'rilla attacking his owner. Retrieved on 2016-12-30. 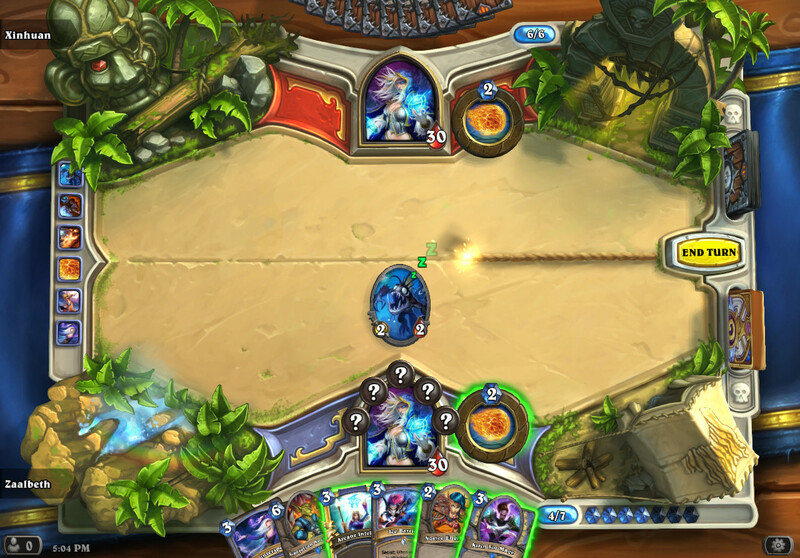 ↑ Senior Game Designer Ben Brode talks Hearthstone. (2014-12-19). ↑ 15.0 15.1 Kobolds & Catacombs Card Reveal Kick-Off - YouTube. (2017-11-20). Retrieved on 2017-11-21. ↑ Ben Brode on Twitter. (2014-05-29). This page was last edited on 3 August 2018, at 02:21.